The Vetro Lofts is the perfect place to call home. If you want to be close to work in the Winter and the Theater for an evening outing then this is the Columbus condo development for you. These downtown Columbus luxury lofts are in Italian Village. The Vetro Lofts offer luxury living at its’ finest. 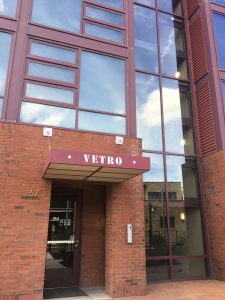 There are spacious two bedroom, two bath lofts located in the, one of a kind, Vetro Lofts building. Corner lofts feature stunning 18 1/2 foot floor to ceiling windows, walk-in closets, washer/dryer hookups, and panoramic views of downtown Columbus. Relax alone or entertain guests on your 700sq foot private outdoor terrace. Be amazed at the spectacular view overlooking the downtown Columbus skyline. These luxury lofts are unique due to the customization by each owner when built. The Vetro Lofts are eco friendly with the finishes and building materials. Each second floor condo includes one climate controlled garage parking spot. In addition, access to the Jeffery Park Community Center, fitness facility, and Jeffery Park community pool. Contact My Columbus Condo today for a private tour or more information.